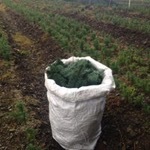 We are now selling premium noble fir foliage. It is suitable for making wreaths and other Christmas decorations. This beautiful foliage is blue/green in colour and has a festive citrus fragrance. They are available in 10Kg bags. Foliage will be freshly cut from our farm. Early orders are advisable.